Gulf Drive Café is a well known establishment on Anna Maria Island that is a restaurant, tiki bar, and a wedding venue. We did this as a package deal with The Sunset Weddings. We did a lot of custom code to get the header to have the style that it has. A beach fades in from the sides with tikis flanking the menu. It was really important that the visitor is aware of all 3 branches of the business. There are numerous call to actions to the wedding and Kokonut Hut pages. Our menu builder was used on menu pages which can very easily be updated by and admin within seconds. This is the first restaurant to use our new mega menu which is extremely flexible. Choose from 1 – 6 columns, an input text, heading, images, or any custom code. We put an image preview and a link to the page. The location on Anna Maria Island is very beautiful so we used large images to make the visitor feel as though they are right there in paradise. 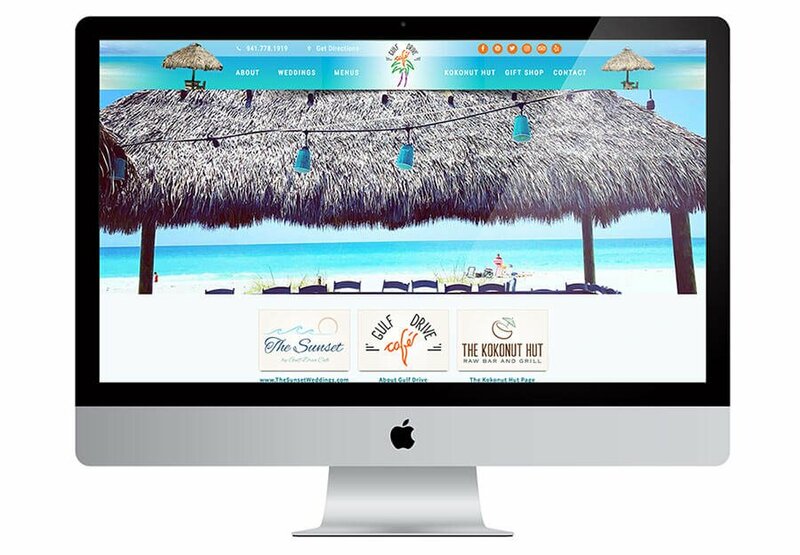 Some examples on the website include a parallax moving beach background, gallery slide shows on Weddings and Kokonut Hut pages, background header images, and content with an image fading in from the side. GDC was very satisfied with their easy to update, visually stunning and modernized website.